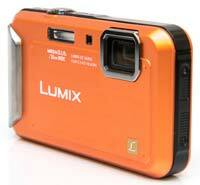 The Panasonic Lumix DMC-FT20 (also known as the DMC-TS20) is a new waterproof, shockproof and dustproof digital camera. The FT20 can be used underwater to a depth of up to 5 meters and is drop proof from a height up to 1.5m, freezeproof to -10 degrees C and dustproof. In addition, the 16 megapixel Panasonic FT20 offers a 25mm wide-angle 4x optical zoom lens, 720p movie recording, Mega O.I.S., AF Tracking, Intelligent ISO Control, Face Recognition and an Intelligent Scene Selector. 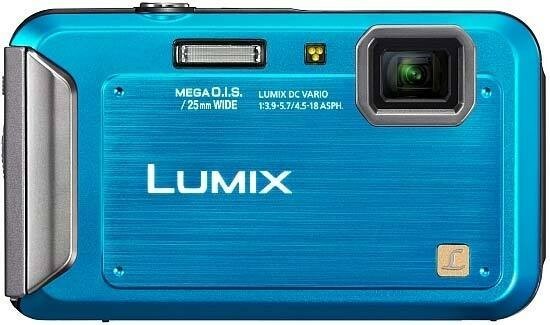 The Panasonic Lumix DMC-FT20 / TS20 is available in black, blue, red or orange and costs £179.95 / $179.95. With an attractively low street price around the £150 / $150 mark, Panasonic's fourth generation toughened camera, coming after the Lumix DMC-FT1, FT2 and FT3, is the wallet friendly FT20 / TS20 (the more full-featured and expensive FT4 / TS4 is also available). The resolution has perhaps inevitably been increased to an effective 16.1 megapixels (from a 16.5 megapixel 1/2.33 type CCD sensor), which as we'll find out later doesn't do the camera any favours. Whereas the FT3 offered waterproofing to 12 metres, the cheaper Panasonic Lumix DMC-FT20 reduces that to 5 metres, and it can only survive a fall from 1.5 metres in height rather than 2 metres, another sign of cost-cutting to hit that appealing price-point. Still, with the same freezeproof and dustproof ratings as the FT3, it's not all bad news and perfectly adequate for the holiday use that it will mainly be subjected to. Measuring 101.0x58.3x19.2mm, so about a third larger than the average business card if you were to upscale one, and weighing 123g, the FT20 is smaller and lighter than the FT3 and easily fits into a trouser pocket. As with most rugged compacts, the FT20 has a non-protruding optical lens offering a modest by current standards 4x zoom, being equivalent to a wide angle 25-100mm in 35mm film terms. Predictably the Leica-branded lens operates a folded mechanism comprised of 10 elements, which means that at no point is it put in harm's way by virtue of protruding from the body. The Panasonic Lumix DMC-FT20 is a chunky, solid feel beast when gripped in the palm, its appearance almost industrialized thanks to the brushed metal front and back plates. It might suffer a dent or a scratch if you forcefully dropped or scraped it, but it doesn't feel like it would shatter into a thousand pieces. Like its predecessors you can't, for the most part, fault the overall build quality. There's not only a sliding catch on the side door protecting the joint battery and SD/SDHC/SDXC card compartment, but also an additional locking switch to prevent any ingress of undesirables. On-screen prompts and warnings also lessen the prospect of accidents or jumping into the pool without doing the equivalent of battening down the hatches first. There's no metal lens cover however that flips open upon power - it's protected instead by reinforced glass, which means the lens is open to the elements at all times. In practice this meant that our review sample's glass inevitably got covered in fingerprints, so you'll be constantly wiping it clean. The lens' positioning towards the top right hand corner of the faceplate (viewed front on), means that unwanted fingertips can stray into the frame when gripping the camera in both hands to take a steadier shot if you're not too careful. What we would also say is that this is a camera that is difficult to handle with wet fingers or gloves on. The FT20's buttons, with the exception of a large and obvious shutter release, are no larger than you'll find on the average pocket compact, so require fingertip position. This was something we grumbled about in our review of the original FT1, but a few iterations latter and we're still fielding the same criticism. To get around this it might be an idea if it featured the Tap control ability of the Olympus range for example, by which certain functions are adjustable by tapping the camera or tipping it in a certain direction, which might have been useful in some circumstances. Still photos aside, the Panasonic Lumix DMC-FT20 also includes the ability to capture 720p HD quality video to a maximum 1280x720 pixels in MP4 format, with a dedicated record button usefully provided, nestling next to the main shutter release button, although again it's on the small side. Other boxes ticked include macro shooting up to as close as 5cm from your subject, 2.7-inch, 230k dot resolution LCD in the absence of an optical viewfinder, and manually selectable ISO range starting at ISO 100 and topping out at a modest ISO 1600, though this can be boosted to an equivalent ISO 6400 with a resolution drop if selecting the familiar High Sensitivity option from among the scene modes. In terms of locating such a setting quickly, there's a simple Mode button on the backplate, leading to an overall streamlined appearance. Press this and you're presented with an eight-option graphical mode menu overlaying whatever's before the camera lens. As well as the familiar scene and subject-recognising intelligent Auto (iA) setting, we get a 'normal picture' mode which is Program by another name, plus Sports (up to 1.3fps continuous capture at full res or 8fps at 3 megapixels), Snow and separate Beach and Underwater modes by way of indicating how Panasonic imagines this camera might be used. The Miniature Effect mode defocuses part of the image to make it look like a diorama. The final icon provides a gateway to 13 pre-optimised scene modes covering the usual range of portrait and landscape photo biased subjects. Let's take a more detailed tour then of the FT20's features and functions, highlighting use and performance as we go. Starting at the front, and the boxy faceplate of the FT20, like its predecessors, features the regular trio of the aforementioned lens, narrow window for the integral flash, plus self-timer/AF assist light indicator alongside it. The flash is set far enough away from the camera's edge to avoid fingers obscuring it, and there's a raised edge or 'swelling' alongside it by way of a handgrip, even though the surface is quite slippery, and when handling with dry fingers. On the Panasonic's top plate we have lost the built-in mono speaker which has now shifted to the bottom of the camera, with a small hole housing the built-in mono microphone on top. The on/off button, which is recessed and level with the bodywork to prevent accidental activation, is positioned to the left of the raised shutter release button, and, as we've previously mentioned, the dedicated camcorder-like red record button for shooting video clips is on the right, its function highlighted in case you weren't certain of the fact by the movie camera icon stenciled alongside it. Over at the far right hand edge - if viewing the FT20 from the back - is a lug for attaching a provided wrist strap: a useful addition if you're skiing down a black run with it. Press the FT20's power button and the camera readies itself for activity in just over a second. Press the shutter release button down fully to take a photo and, with no discernable shutter delay (or rather 0.005 seconds as officially tested), a full resolution JPEG is committed to memory in 2-3 seconds, the screen briefly blacking out before displaying a frozen image of the captured shot. Panasonic also claims the FT20's AF, or rather the aptly named 'Sonic Speed AF' is 28% faster than its older FT2 predecessor. Whilst we can't vouch that precisely, it's certainly as quick as anyone would want from what at the end of the day is a point and shoot pocket camera. With two thirds of the camera's backplate taken up by its toughened 2.7-inch, 230k-dot resolution LCD screen - incidentally also the same spec we found back on the FT1 - which self adjusts brightness levels according to ambient light levels at the time, it's to the right that we find the familiar smattering of operational controls. It feels slightly odd that the camera's zoom is operated by a pair of adjacent lozenge-shaped buttons, located at the top right hand corner, rather than the familiar rocker switch; because, to move between wideangle and telephoto options, your fingers have to perform a little dance between them, rather than just press harder at one edge to effect an alteration to the framing. With the camera's lens at its widest setting from the off, a press of the right hand (telephoto) button and its travels through the focal range slowly but steadily and moreover nigh silently, in around three seconds. The zoom can also be utilized when recording video clips, but slows down further to avoid mechanical noise being a distraction, taking around five seconds to get from wide to tele setting. There's nowhere really to place your thumb/s at the back of the camera when shooting handheld. As a result the thumb of the right hand skates across the controls for playback and aforementioned shooting mode button, whilst that of the left hand inevitably finds its way onto the screen itself. With capture mode inevitably the camera's default setting there's no control button thus named. We get 'playback' for reviewing images and just need a half press of the shutter release button if a photo opportunity should present itself to enable us to jump back into capture mode - a set up we prefer to having to otherwise flick a switch between the two settings anyway. Beneath these two buttons is a regulation issue four-way control pad/cross key set up with equally familiar menu/set button at its centre for firstly calling up the former on screen, and secondly effecting changes to the offered settings with a subsequent press. At 12 o'clock on the surrounding pad is a means of tweaking exposure compensation (+/- 2EV with an on-screen slide bar provided), then as we move around clockwise we find a means of adjusting flash options (auto, auto with red eye reduction, forced flash on, slow sync flash with red eye reduction and flash off), then selecting macro setting for close ups (as close as 5cm) and/or self timer (an option of two or ten second countdowns). A press of the menu/set button meanwhile brings up a trioof icon-distinguished folders on screen, including the regulars of still Recording, Motion Capture plus a third option of Setup. The contents of the first photo record folder are split across four screens if you have the camera in 'normal' shooting mode and run the gamut of picture quality and size settings along with the ability to adjust aspect ratio from 4:3 to 3:2 to 16:9, and, more unusually on to 1:1. We also get intelligent ISO among the ISO settings, and the ability here to select incremental stages from ISO 100 up to ISO 1600 as one would normally, which is a fairly modest range as previously mentioned. White balance can also be adjusted manually, whilst AF mode can be swapped from the default 1-area AF to 23-area, or to spot AF, or by contrast AF tracking, as well as to face detection mode if you're going to be taking portraits in the main. It's here that we also find the colour mode options, which, as back on the original FT1, can be altered from the default of 'standard' to vivid, B&W, or sepia. Dipping next into the video recording folder we find a mere two options, Quality and Continuous AF, reflecting the entry-level nature of the FT20. The set up icon/folder meanwhile provides access to six screens' worth of options and it's here that we get to turn a histogram on/off or call up a nine zone compositional grid on screen, as well as set date, time, and format the internal memory or card in use. The remaining two buttons at the bottom of the camera back are for the self-explanatory Display and the less immediately obvious 'Q.Menu'. A press of the latter 'Quick Menu' option brings up a toolbar across the top of the LCD screen, allowing the user to quickly tab through options for adjusting picture size, AF mode, white balance, ISO speed, burst mode, video quality as well as adjusting the LED light and monitor brightness. Basically, these are your key settings at a glance, saving the time required to dip into the menu folders mentioned above. Subsequent presses of 'display' meanwhile turn off the otherwise constant onscreen icons and shooting info to provide an image clear of distractions, and/or call up a nine zone compositional grid on screen for those users practicing their rule of thirds. On the right hand side of the FT20 meanwhile, under a chunky, lockable cover we find a port for connecting the camera up to an HD TV set via an optional mini HDMI cable, which also doubles up as the AV Out port. This sits alongside the slot for the memory card and provided rechargeable battery. Battery life is good for around 250 shots from a full charge, down from the FT3's 310. The base of the camera meanwhile features a familiar plastic screw thread for attaching the camera to a tripod and the mono speaker, and that's your lot as regards features and functionality.